A permanent, active z/OS tcVISION agent is no longer required for the processing of Db2 z/OS Active Logs. This “agentless” connection analyzes the Db2 Active log and extracts the changed data using a Db2 User Defined Table (UDT) and a connection to Db2 z/OS via DRDA or a Db2-Client. IBM z-, distributed- and cloud-platforms and show solutions that meet your requirements. Visit the Treehouse Software website for more information on tcVISION, or contact us to discuss your needs. If you are attending SHARE in Pittsburgh in August, or CA World in Las Vegas in November, be sure to stop by the Treehouse Software booth and say hello! We’ll be featuring our comprehensive and flexible portfolio of solutions for integration, replication, and migration of data between mainframe sources and any target, application or platform using ETL, CDC, SQL, XML and SOA technologies. Visitors to our exhibits will learn how Treehouse Software is currently providing several large organizations with ETL and real-time, bi-directional data replication using tcVISION. 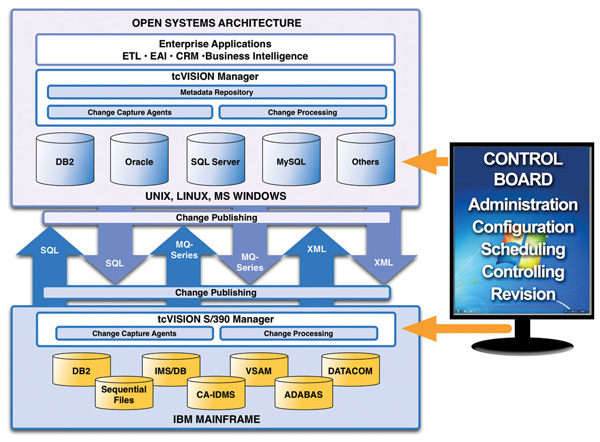 tcVISION provides easy and fast bi-directional data replication between mainframe, Linux, Unix, and Windows platforms. 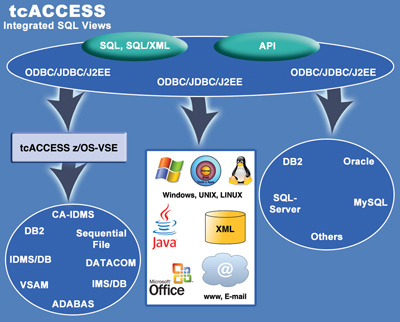 We will also showcase tcACCESS, which integrates mainframe data and applications with open systems and Windows.